Did you grow up eating Jello? I didn’t have it too much as a kid because my mom was (rightly) concerned about the ill effects of food dyes and sugar, but when I did, I remember being fascinated by the bright colors and the way it jiggled. Cherry jello chunks glistened like a bowl of rubies. Jello Jigglers were especially fun (finger food anyone? ), which is what I’ll be showing you how to make today (in a health-ified way, of course). I re-encountered Jello (a lot) while doing my dietetic internship at a major hospital in Los Angeles. At the time, I struggled to understand why in the world a hospital would be serving such junk (and neon-colored Jello epitomized fake food). But it turns out gelatin has many benefits. If you’ve been following my blog for a while, you’ll remember I touched on some of these benefits in my post about homemade broth (aka bone broth or stock). I’ve also discussed gelatin in a number of interviews on prenatal nutrition. So, what are the benefits of gelatin? Digestive – Gelatin may help heal the gut lining and assist in absorption of proteins in the diet. It may even help normalize stomach acid secretion. Maybe that’s why grandma always made you broth or soup when your tummy was upset or why you were given Jello when you had food poisoning. Detox – Glycine is essential in the production of the liver’s primary phase II detoxification enzyme, glutathione. Gelatin is one of the richest dietary sources of glycine (1 of every 3-4 amino acids in gelatin is glycine). You may recall how I specifically used glycine to get rid of my never ending headache, which stemmed from an inability to adequately detoxify salicylic acid. Joints – Gelatin is derived from collagen found in the bones, joints, skin, and connective tissue of animals. When collagen denatures (from heating + treatment with either acid or alkaline hydrolysis), it forms gelatin. 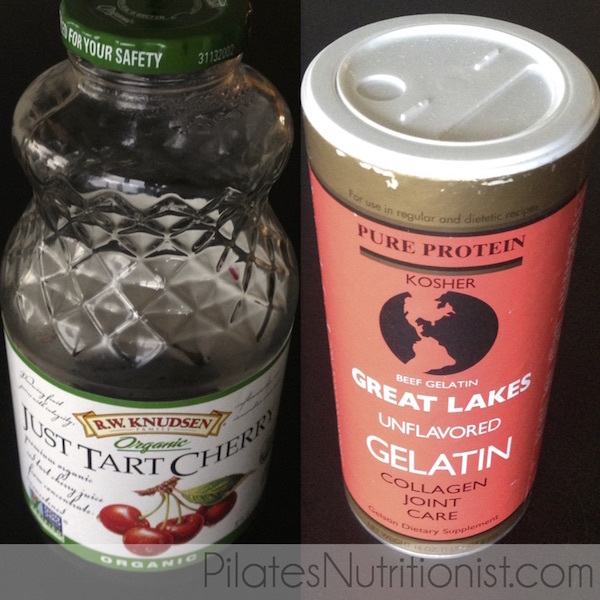 So it makes sense on a very fundamental level that gelatin benefits joint health. Studies show collagen supplements improve joint comfort and reduce joint pain. Skin – The amino acids in gelatin are key in maintaining skin elasticity and tone, specifically glycine and proline, which stimulate production of the body’s own collagen (it’s like getting the benefits of a collagen injection from the inside-out). Pregnancy – If you’ve read my book, Real Food for Gestational Diabetes, you’ll know the crucial role that glycine plays in a healthy pregnancy. Glycine must be obtained from the diet during pregnancy, since the body’s production cannot meet demands. Glycine helps with the formation of new tissues (both of the baby and the growing uterus) and in the creation of fetal DNA. That’s kind of a big deal. Inflammation – The glycine in gelatin helps to balance out other amino acids in the diet, in particular, methionine. High methionine levels trigger increased homocysteine levels, a known marker of inflammation. High homocysteine levels increase the demand for other nutrients, especially certain B-vitamins. Blood Sugar – Glycine may have specific benefits when it comes to managing blood sugar, most likely by stimulating the secretion of certain gut hormones that impact insulin secretion. Sleep – The glycine in gelatin has even been shown to help you sleep better. As much as we like “dis” hospital food, they aren’t so far off base for having Jello on the menu (although the processed sugar, artificial flavors, and food dyes – and inhumane sources of gelatin – probably outweigh some of the benefits). Obviously, I care more about quality than the hospitals. In my version, which I call Tart Cherry Gummies, I use gelatin sourced from grass-fed cows (this brand). For sweetness and flavor, I use organic tart cherry juice. Although I generally suggest you avoid fruit juice, this is one of the few ways I think it can fit into a healthy diet (the glycine in gelatin can attenuate the spike in blood sugar from consuming sugar when eaten at the same time). I specifically recommend organic tart cherry juice because it has broad-reaching health benefits. For one, it’s been shown to reduce inflammation and speed muscle recovery in athletes. Tart cherries may also help reduce the risk of cardiovascular disease and diabetes (at least in rats). If you’re gonna have juice, you may as well choose one that’s high in antioxidants, has good flavor, and might give you some bonus health benefits. Mix ingredients in a small saucepan set over medium-low heat. Stir while the mixture heats, so the gelatin completely dissolves. Once you no longer see gelatin granules, remove from heat and pour into a glass dish (I used a pie plate). Place in the refrigerator to chill for 30 min, or until gelatin sets. Cut into bite-sized pieces (I used small round cookie cutters) and store in an airtight container in the refrigerator. NOTE: *You may use any juice you’d like with the exception of pineapple (because it contains the protein-digesting enzyme bromelain, so the gelatin won’t gel!) I prefer this grass-fed gelatin. 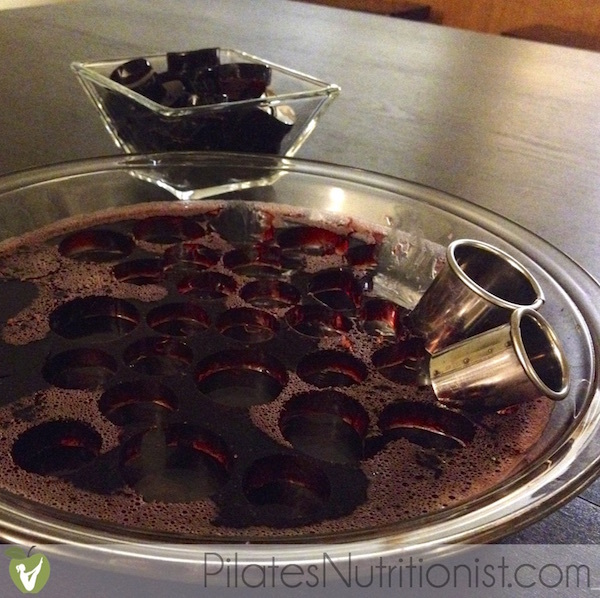 Tart Cherry Gummies make a great post-workout snack, bedtime snack/dessert, and digestive aid. 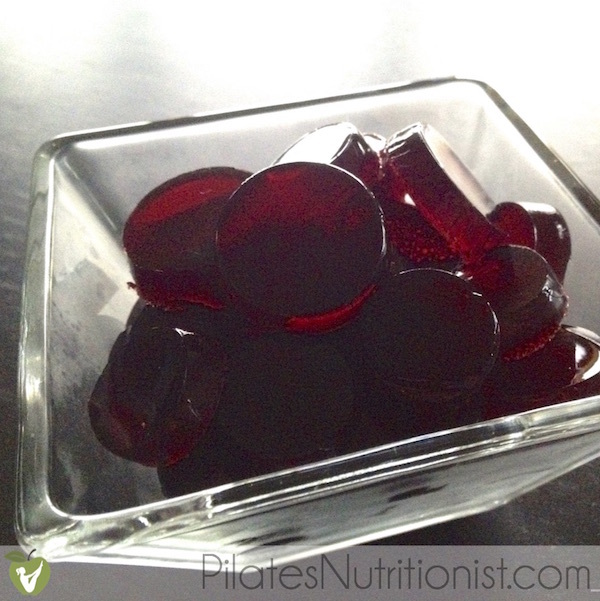 Have you made all-natural jello or gummies at home before? If so, how’d they turn out? My boys are going to love these. I’ve never thought of cherry. They love cherry. Cherry is one of my favorites. I hope your boys like ’em! They’re also great with 100% blueberry or pomegranate juice. Great idea, Lily. How long do you think these are OK to keep in the fridge? Thanks Lily. Love this idea. I guess I can put the gelatin in my protein/green smoothies as well. Yes you can, Carol. However, I’d suggest using the “sister” product, Collagen Hydrolysate, since it does not gel in liquids. I tried making gummies with my kids the other day. We didn’t add any sweetener and they weren’t too good (sadly). I’m going to try with stevia or maybe just a bit of sugar. Still better than the commercial stuff. How many would constitute a serving enough that it would aid recovery? What is a serving for a 3 year old and at what age can babies eat these? My girls are 11 months. Thanks ! !